Silk worm cocoons at professor David Kaplan’s lab at Tufts in Medford. When Dr. Ailis Tweed-Kent was an internal medicine resident at Massachusetts General Hospital, she saw arthritis patients who were sometimes unable to work because of the pain. She could prescribe pain relievers, but she felt frustrated that there wasn’t more she could do. In 2013, she founded Cocoon Biotech Inc. to come up with a way to treat the actual cause of arthritis, the loss of cartilage in joints. For the therapy, she turned to a biomaterial that has been used for thousands of years: silk. Cocoon, which is moving to LabCentral in January, is developing tiny silk balls that can be injected into arthritic joints as a lubricant. It is one of a number of biotech companies exploring how to use the ancient material in cutting edge treatments, applying it in fields from drug delivery to tissue repair. What makes silk so special, researchers and entrepreneurs say, is its versatility, something that a synthetic material has not yet replicated. Silk has the added benefit of being naturally biocompatible, meaning it’s safe to use in the body. 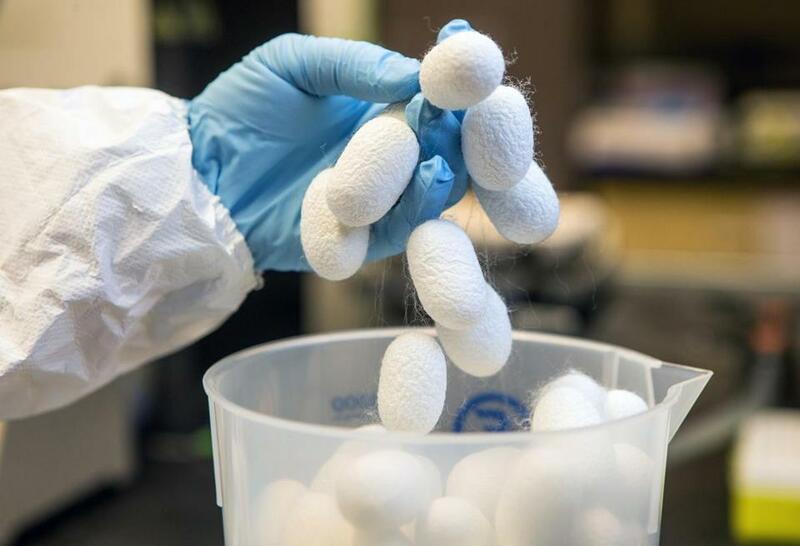 “It’s a simple protein, basically, and yet it’s all in the way it’s processed and used,” said David Kaplan, chair of biomedical engineering at Tufts University, who has studied silk for more than two decades. Cocoon is one of a number of biotech companies that have licensed silk technology from Tufts. The microscopic spheres it has developed are meant to be injected into joints where they can lubricate the bones’ surfaces as a stand-in for lost cartilage. These spheres, which are currently being tested in animal models, could be loaded with pain relieving drugs or, in the case of joint replacements, antibiotics. The drugs would be released gradually over a number of months as the silk protein broke down. Vaxess Technologies Inc., another company that has licensed Tufts technology, hopes to use silk to create vaccines that don’t need refrigeration, enabling them to be shipped easily and cheaply around the world. Vaxess is still testing its methods of isolating a single protein, fibroin, from silkworm silk and combining it with a vaccine. As the mixture dries, the fibroin forms solid structures — akin to how it transforms from a liquid into a solid as it passes through the silkworm’s glands. Those solid structures lock the vaccine particles into place, protecting them from the heat that can damage or destroy them, said Vaxess CEO Michael Schrader. The dry vaccines can then be reconstituted and delivered as a conventional injection. Other companies that have licensed silk technology from Tufts include Waltham-based Akeso Biomedical Inc., which is developing silk-based implants to help wounds heal, and Medford-based Serica Technologies Inc., acquired by Allergan Inc. in 2010, which created silk scaffolds to help repair damaged tissue. He’s met presidents — American and others — and Spanish and Japanese royalty. But there’s just something about the queen. “Somehow the queen of England — that’s like a very special person” said Robert Langer, the renowned MIT professor famous for his fleet of patents and for launching a stable of startups. Even with all those accolades, Langer is particularly excited about his meeting Monday with Queen Elizabeth II at Buckingham Palace, where he will receive the Queen Elizabeth Prize for Engineering. The £1 million prize (more than $1.5 million) has only been given out once before, in 2013, to five people credited with creating the Internet and World Wide Web. Langer is this year’s sole recipient. Another bonus: His wife and children are also invited to the palace. “To get to take my family there, that’s very special, too,” he said.